This list is filled with a bunch of my favourites that I have saved at the moment. The Boardwalk sandal, jute circle bag, Levi’s, the slouchy pants, and the floral shawl are things that I have wanted for a while and thought they would fit perfect for this trip. This is a compilation of summer-ready outfits that can be easily dressed up (just add a blazer and some accessories) or dressed down. When the sun is baking hot you want to stay cool but look put together so they key is to include items that will mix and match really well. A small range of shirts in a variety of styles, and a couple of sweaters for cooler evenings and air conditioning should be enough for your top half. A pair of jeans will definitely be worn in Denmark and/or for travel, some slouchy casual pants that are comfortable and cool, and some trousers that can be cuffed. A blazer for an easy way to take a outfit from day to night, and a light jacket if you think you will need one. Two dresses, and a skirt (make sure the skirt can be worn with every top) round out the clothes. For accessories I included one small scarf and one large shawl style. This shawl can be carried in your bag and be folded in half and thrown over your shoulders if you are wearing anything sleeveless and are visiting a religious site that requires coverage. It can also be used as and easy swimsuit cover. You will probably get the most use out of the sandals and sneakers but it’s always a good idea to toss in a dressier pair, and flats work well if you don’t want anything with heels. This is a large list for an extended trip, and if you know that you will have easy access to laundry than you can easily cut out some pieces*. They say if you are going on a trip that is longer than 2 weeks, all you need to do is pack for one week and do laundry weekly. For such a long trip I can see you getting wardrobe fatigue if wearing the same pieces on repeat if you only packed for a week which might lead to some unplanned shopping. 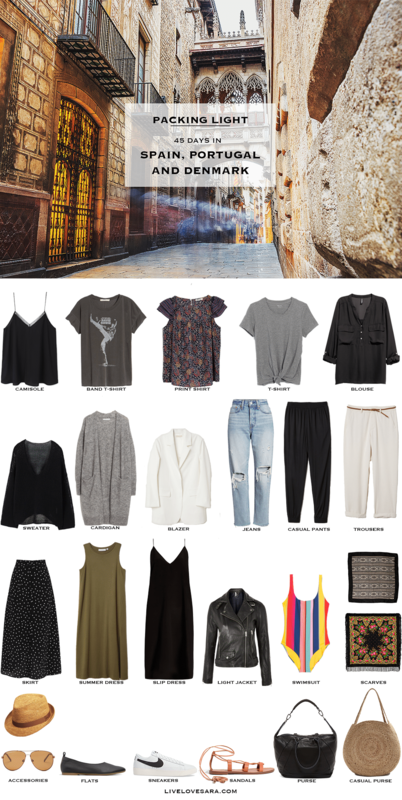 This is why I like to include a few extra pieces and pre-plan the outfits, so that you have something to refer to if you if the wardrobe fatigue hits mid trip. *You can also cut out some pieces and use this to help guide you for shorter trips as well. I think I also love that swimsuit. What about you?